Unlike its key competitor, the VW Golf R, the Focus RS utilizes an all-wheel-drive system that is said to have been designed entirely in-house. Assuming the RS is traveling in a straight line with zero slip at any of its four tires, the all-wheel-drive setup sends 100 percent of the available power to the front axle. When slip is detected or if there is steering input, up to 70 percent of the available power can be sent rearward. 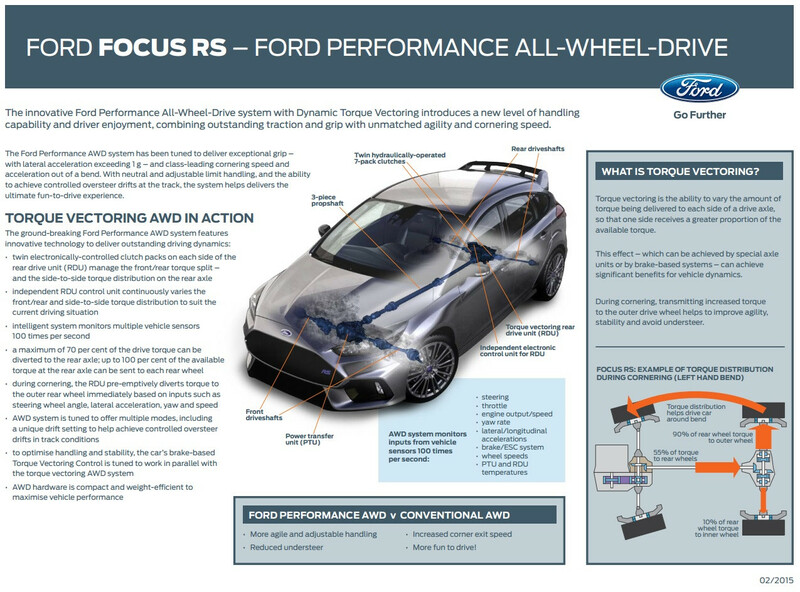 More details on the 2016 Focus RS AWD system. AWD system has a Drift setting. Now that is awesome. Great infographic. The split of torque to the rear wheels looks great to me and seems like a setup that could in fact be one of the better setups out there on the market. Ford’s engineers rarely get to do things that upset the Blue Oval’s all-powerful accountants. Given that, our biggest surprise at the unveiling of the new Focus RS was the car’s extremely clever torque-vectoring all-wheel-drive system, considering the massive costs that must have gone into re-engineering the front-drive Focus to take it. And although there’s no official confirmation of anything, the Ford execs on hand at the reveal event were happy to drop some very broad hints that we will see the system spread elsewhere among “performance” applications within the group. Not that Ford is first to this particular party. The official details of what Ford calls the Focus’s Rear-Drive Unit are almost identical to those of the rear axle “Active Driveline” that Land Rover has recently introduced on higher-performance versions of the Range Rover Evoque. Both use twin electronically controlled clutches on the rear axle to send torque to the back wheels, and both are claimed to be capable of the same neat side-to-side torque-vectoring trick. Land Rover’s system is made by GKN Driveline in Sweden, with the system being branded as “Twinster.” Ford did say they worked with GKN on the Focus RS, but we don’t know if the RS uses the exact same system or just a similar one—Ford executives refused to say, however nicely we asked them—but in any event it looks like an idea whose time has come. As with Land Rover, Ford’s twin-clutch rear setup is likely to be the preserve of pricier and more dynamically focused cars; lesser four-wheel-drive Evoques still make do with a single-clutch system upstream of a conventional differential. But it’s not hard to see plenty of interest in Ford products that can deliver both more traction and increased agility. “I think it’s a breakthrough technology that has many opportunities,” Bakaj told us. This has me wondering how much they spent to reengineer the thing, must have been in the high tens to hundreds of millions. To be honest, i don't really care if the system is developed in house or not. What matters is how good it is. S.Elliot, kellygnsd, ExtremeFocus and 1 others like this. Ultimately that's what matters, since its what will really effect us come time to put it to work with what we'll put it through. I expect that we'll see some publications digging into it when the time comes. This system and Subaru's AWD system needs to go head-to-head and ASAP!